The glamour of Old Hollywood is brought to life in these authentic reproduction Art Deco era sandals, named "Eve." After all, it's all about Eve! With a beautiful, flattering caged toe, keyhole t-strap, and open sides, the Eve sandals are the perfect shoe to transition from day to evening. Pair your Eves with all kinds of vintage and retro dresses or wear them with modern outfits for a vintage spin. Day to night comfort and style for your feet. Made of top-quality leather in subtle shine black. They are lined in real leather, with padded arch support, and rubber soling. 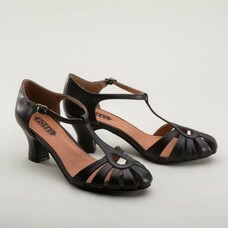 The comfortable 2.5" heel is well-balanced and will keep you on your feet for hours. Eve 1930s Sandals also come in stunning Rose Gold.